One of my great friends in Chambéry was an outspoken and inquisitive Italian named Elisabetta. We hung out practically every weekend, cooking with friends, watching movies, but we had rarely spent much time one-on-one, mainly because we were surrounded by so many wonderful friends. One weeknight during the February vacation, all our friends had returned home, were traveling, or had family visiting, and not wanting to waste an evening, we naturally made plans, just the two of us. 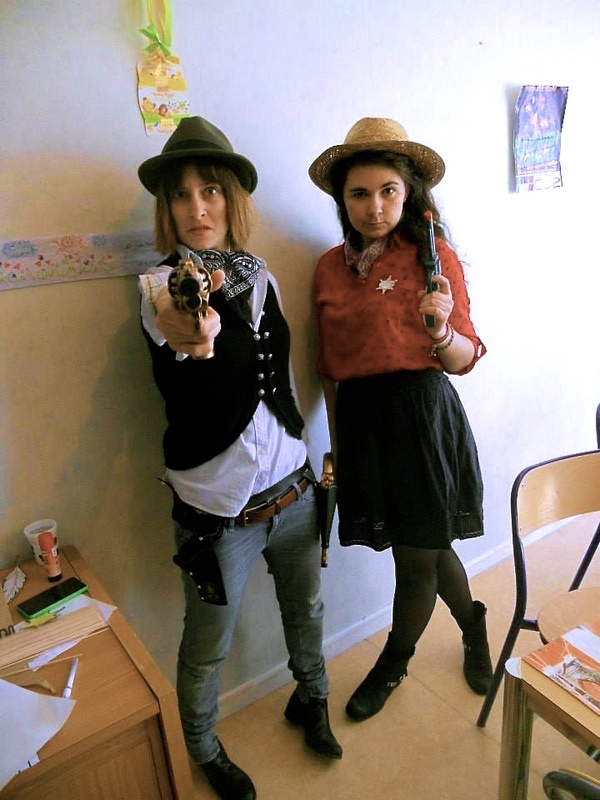 Here’s Betta and me in the Wild Wild West. After watching a movie (Alceste à Bicyclette, one of my favorites! ), we were cleaning up from dinner when Betta, sponge in hand, said, “Okay, sorry. I have this song in my head so I just need to play it, do you mind?” “Well, we’re in your house…by all means! !” And she put on the opening Witches chorus from Verdi’s opera Macbeth. Being just elitist enough to want to wake up with opera stuck in my head, but uncultured enough to know next to nothing about it, I pretty much thought that was the greatest thing in the world. I have wanted to listen to and learn more about opera for a long time. It seems like this whole world of stories and spectacular theatricality that is completely foreign to me, but that, as a theatre artist, I want to know better. It’s just a completely un-American art form — not in the sense that Joe McCarthy would blacklist it, but it does seem to have a very daunting impenetrability for someone who grew up on (the very American) musical theatre. And the fact that like 95% of it is performed in German, French or Italian doesn’t exactly make it easy for me to pop on the soundtrack and follow the story with ease. I’ll admit, I thought that was the coolest thing ever. I’m not sure why the anecdote left such an impression on me, but all that week I told all my friends at home about my friend whose favorite opera prompted her to learn French. “How cool is that? !” I wish I could say that I was inspired by reading Molière or Sartre. Even being enchanted by the music of Céline Dion would make for a fun story, but the truth is….I signed up for French in middle school because it seemed like a better option than Spanish or Latin and it’s what my sister did three years before me. In the past few weeks, I have been reveling in the return of international soccer, with the 2015 Women’s World Cup. Now, many of you may not know I used to be a complete soccer nut. 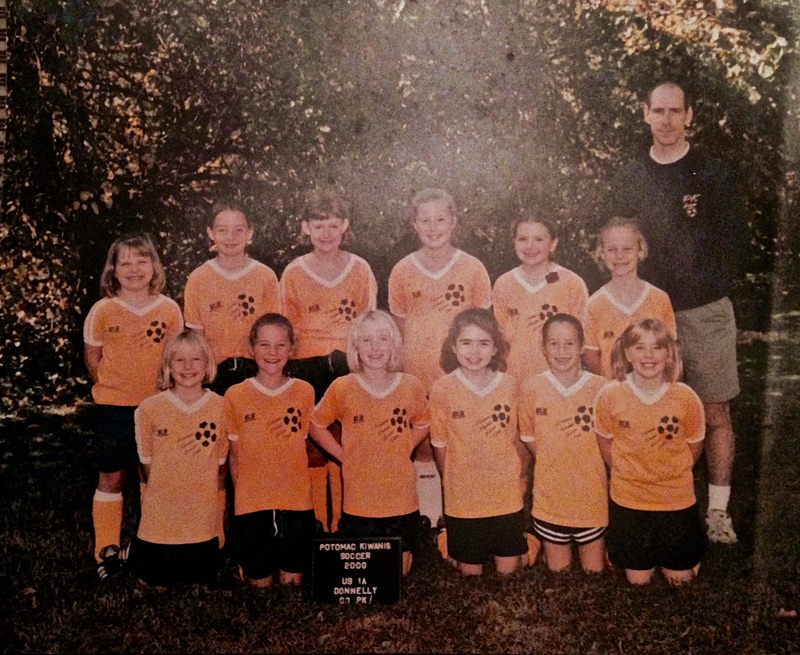 Though I played on recreational teams from age 5 to 18, I never played competitively enough to develop any legitimate skills, but I kept at it because I genuinely enjoyed playing with my teammates, even though it meant waking up for 8:00am games every Saturday. We had a big winning streak sometime around 5th or 6th grade, but after that rarely won a game. Our team always won the sportsmanship awards though, because we were one of the few teams in the league not made up of travel or high school players looking for some extra training on the weekends. The epitome of amateur, we just showed up to play and have fun! I was much less intrigued by the analysis and minutiae of The Beautiful Game, but absolutely entranced by the culture surrounding it. It seemed so intensely layered and specific and historic in a way that America lacks for most sports. Then, the World Cup came around and I found an American iteration of that same camaraderie, only this time magnified by the element of patriotism which has only strengthened as our nation continues to accept pro soccer into the mainstream and our national teams keep improving. While watching the Women’s World Cup these past weeks, I was struck with a kind of revelation: Soccer is the reason I studied French. It’s the reason I almost took Spanish in college and the reason I have dabbled in language learning in as long as I have. I even wrote one of my college entrance essays about it. From the beginning, the question that has always fascinated me the most when watching matches was not whether a 4-4-2 formation would help the Netherlands break down the Japanese defense, but what language the players spoke to the Greek referee. Or how a collection of players from Spain, Germany, Brazil, Croatia, England and Ethiopia managed to get along and train with a manager who only spoke French. There’s just something about World Cups, and Olympics too, that make me really on fire with patriotism for my country, and countries I feel connected to, like France. The only thing that can get me misty eyed more than Audra McDonanld singing ‘Climb Ev’ry Mountain‘ is listening to the national anthems of the world played before a match or a medal ceremony, and seeing in the athletes’ eyes the gravity of representing their country. Though I am by no one’s standards an athlete, nor do I possess more than a passing interest in most other athletic endeavors, somehow sports became my conduit into the rich multiculturalism of the world, igniting a curiosity for other cultures and languages that has carried me to where I am today. This photo was my desktop background for a while. What’s your story? Why did you learn French? What first ignited your passion?